Following tutelage from Bill Bruford, being very politely turned away by Anthony Phillips, appearing on a handful of obscure releases in the 90s, and producing work which caught Rick Wakeman's ear, a decade and a half later Duncan finally started releasing albums..
and “C:Ore” present emotional journeys and song cycles in music and animated form. and many other digital retailers. "The album can only be appreciated through immersion. The levels of lyrical acuity and textured arrangement yield more and more with each listen. 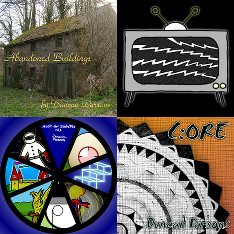 Some excerpts from Abandoned Buildings are available on Duncan's SoundCloud account. To accompany "Abandoned Buildings," a collection of animations have been made for 10 of the album's 18 tracks. These are available on the DVD "The Abandoned Buildings Cinema Show," and can be ordered from the shop. Extracts are being exhibited on YouTube. Note – These were from ongoing mixes, rather than finalised masters, and as such are a collection of representative snapshots. Samples for Music for Stairlifts (Volume 1). Samples for Music for Stairlifts (Volume 2): (Adapting Silent Films) For The Radio.